When I was first learning Chinese, I asked a semi-native Chinese speaker what her recommendation was for learning to read and pronounce Chinese. Was pinyin sufficient or was bopomofo worth pursuing? Her answer was that she didn’t think bopomofo was necessary and might even be confusing. To put things in perspective, she had learned Chinese as a child and spoken it up until around the age of 15. At that point in her life, she moved to the United States and didn’t speak or read Chinese for many years. However, now near the age of 40, she was coming back to the language, practicing reading newspapers, and living in Taiwan. I think her answer made perfect sense to her, but I think it was wrong. She already had an ear and eye for Chinese. Although she was relearning it in one sense, she already had a very strong base in it, having grown up in a Chinese household and hearing her parents speak it, even though she didn’t use it much. Therefore, she could not truly comprehend the challenge to a person who was just learning Chinese for the first time. The first year or so, I stuck to pinyin for learning about Chinese pronunciation. I made some progress, but when I moved back to the USA, I found another, local native speaking Chinese tutor. When she often lapsed into using the bopomofo phonetic representation that she had learned in grade school in Taiwan, I noticed it seemed to flip a switch in my brain. Using the bopomofo kept my brain in Chinese-mode and made me more aware of the distinct Chinese pronunciation of the sounds represented. Something about not having the English (also known as Phoenician or Roman) alphabet characters there, also made it more natural to tune into the Chinese characters. My guess is that because my brain wasn’t trying so hard to latch onto the alphabet it knew so well, it was freer to read the Chinese characters. 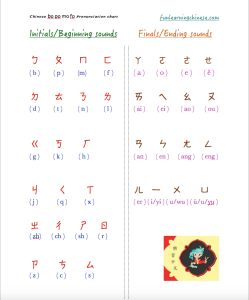 There is a link to a printable pdf below, as well as an audio of my tutor reading the chart with correct Chinese pronunciation. My tutor and I still use pinyin quite a bit, partly because it has been the easiest way to discuss pronunciation during my online lessons. (edit 3.22.2018: My tutor exclusively gives me pronunciations using bopomofo during my online lessons now, too.) I also only recently learned how to type the bopomofo symbols on my computer. I have about half of my lessons via Skype because my tutor lives far enough away that driving to her home every week is a problem. But when I am at her house, she uses bopomofo almost exclusively next to the new characters in the study material. At first, she was apologetic, trying to force herself to write in pinyin, but since I had noticed the advantages, I told her to just use the bopomofo. I didn’t even have all the phonetic symbols memorized, but with her saying the words and explaining pronunciation, I was able to practice them without referring to a chart during the lesson. I also ended up practicing it when learning from childrens’ books, written for Chinese speaking children. These books commonly use the bopomofo to help the children read. Creating an easier to read bopomofo chart for everyone! When I would review the handwritten lesson at home, I used a couple of bopomofo-pinyin conversion charts I had, but I always found those charts a bit cluttered and oddly organized. In an effort to aide with pronunciation, there was just too much information to wade through to quickly look up a particular phonetic symbol when trying to read. When I spoke to my tutor about trying to make a simplified chart, she told me about the pattern of reciting bopomofo that she had learned in grade school in Taiwan. She also mentioned that they were never taught the extra combinations often added on to the charts. Such combinations are probably meant to help the Chinese as a second language learner, but they are really unnecessary. They are all combinations of the basic bopomofo symbols. It is color coded, all on one page, and nicely spaced for quick visual searches. I didn’t want any of the other pronunciation translations on there, because not only would most people have to look them up in a dictionary to know what they meant, but the correct sounds are best learned by hearing them. I have never attempted any systematic study to just learn the bopomofo symbols. Rather, I have found that it is easy enough to learn them by using them and having a chart to quickly refer to. 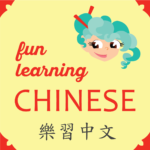 No need to make it something to study as a separate part of learning Chinese. This Wiki article is a good history of bopomofo, also known as Zhuyin. 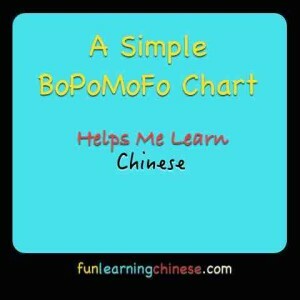 And here is another Chinese learning article from another blog that comes to the same conclusion I did about how useful bopomofo can be to learning. I will be putting copies of the bopomofo chart in a couple of strategic locations so that I can find it easily when studying. One will be secured to a pull out extension on my main desk, and the other will be taped down like wallpaper on my lap desk. My graphic arts daughter showed me how I can right click on the photo of it that I saved, and the drop-down menu gives the option to set it as my computer desktop photo on my Mac. There is another option in settings for the desktop photo to be scaled to fit, so with a little reorganization of icons, I can now see it in the middle of my computer screen, too. What will you do with your bopomofo chart? Keyboard stickers make typing in bopomofo very easy. I write about that in Chinese BoPoMoFo Stickers for My Computer Keyboard. It really doesn’t get much easier than this!